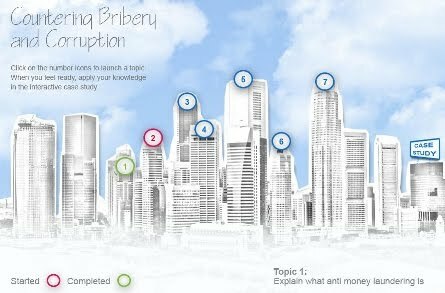 The Bribery Act, which came into force in July 2011, means the UK now has the most comprehensive anti-bribery legislation in the world, enhancing its reputation as a safe commercial environment in which to do business. To help support banks in their ongoing efforts to comply with the Bribery Act 2010, the British Banking Association (BBA) has published its new ‘Bribery Act 2010 - Guidance on Compliance’. The BBA stresses there will be a continuing need for the banking sector to collaborate closely and share best practice and experiences as the legislation is tested in a legal and practical sense. The new ‘Guidance on Compliance’ publication focuses on helping banks assess the policies and procedures they need to put in place to meet the requirements of the Act, and also considers the links with other requirements such as FSA regulations. In partnership with BBA, Unicorn Training was the first-to-market with our updated Countering Bribery and Corruption course last year, incorporating the Ministry of Justice guidance dealing with Sections 7-9 of the Act, which had led to the initial delay in the Act coming into force. There are financial services sector and insurance-specific versions of the course, both of which shun the traditionally dry ‘tick-box’ compliance learning style by focussing on engaging the end user in practical situations that make the course relevant to them. The underlying principle is to engage the learner by testing their ability to apply knowledge in familiar, practical situations. The course opens with a short ‘cameo’ of a character talking emotionally about his personal experience of the consequences of not following or understanding his regulatory obligations. The subsequent interactive content includes sector-specific case studies. Download the BBA ‘Bribery Act 2010 - Guidance on compliance’.